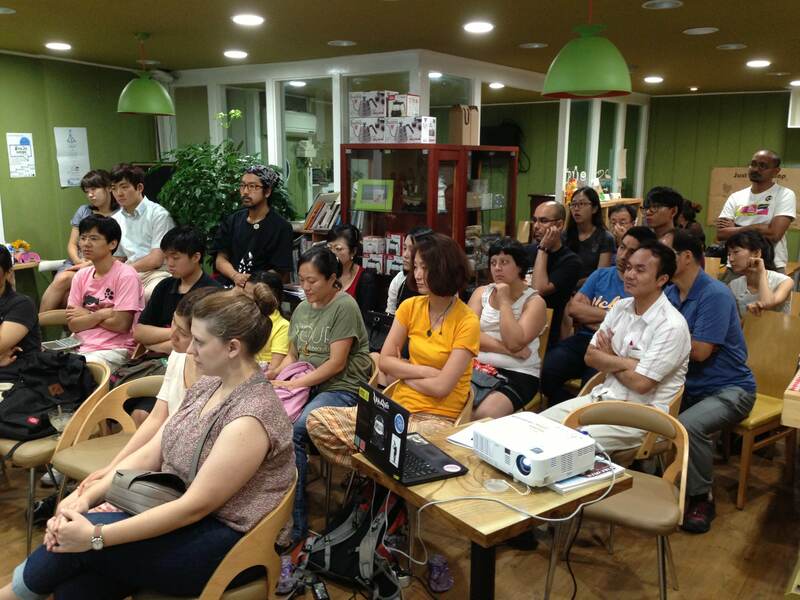 You can listen to an audio recording of Noura’s talk (in English with consecutive Korean translation) here. Noura Mansour is a highschool teacher in Acre near the northwestern coastal city of Haifa. She is also a member of the National Democratic Assembly (Tajamoa Party) which currently has three representatives in the Knesset, offering perhaps the strongest voice for Palestinians inside Israel’s political process. Her ability as a debating instructor brought her to Korea with other international debating trainers to work with young Koreans. It also gave us the opportunity to invite her to hear from her about her own personal experiences as a Palestinian living inside Israel and Israel’s plan to forcibly evict tens of thousands of Bedouins from their homes in the Naqab (Negev). Palestine Peace & Solidarity’s very own Sarah helped out by providing interpretation for our Korean speaking audience. Noura Mansour before her talk at fair trade Cafe Tripti on Tuesday, August 6. She told us that the Israeli state has always treated the Palestinian minority to which she belongs with suspicion and mistrust. After 1948, Israel imposed a military regime which lasted for two decades, coming to an end in the early 1970s. The regime imposed military rule only on certain geographic areas which were mostly populated by Palestinians. She reminded us that Palestinians have not still forgotten the massacres committed by the Israeli military forces against their communities. Following the military regime, Israel began to carry out a number of land confiscations, forcibly expelling many Palestinians living in Israel from their land. This continues today and the latest chapter is the so-called Prawer Plan which aims to expel tens of thousands of Bedouin communities from their homes and lands in the Naqab Desert (a subject to which we will return). Having has lived her life as part of the Palestinian minority of Israel, often referred to as Palestinian citizens of Israel, she told us that she is constantly reminded that she remains in the land that hundreds of thousands of Palestinians were driven from in 1948. Palestinians today make up some 20% of the total population of Israel but face many obstacles and forms of discrimination. Part of this systematized discrimination includes separate schools for Palestinians and Jews. Anti-Arab racism is common and many village councils actively encourage the Judiazation of their communities – the promotion of racially exclusive communities which of course entails the exclusion of Arab inhabitants – in the name of ‘cultural cohesiveness’. Another sign of what I will refer to as the deepening of apartheid with moves such as the potential passing of the so-called governability law which aims to force out minority parties such as Balad out of the Knesset by raising the voting threshold from 2% to 4%. An engaged audience learning about what it is like to be Palestinian living inside Israel. Every Palestinian has her or his own painful stories to tell. Noura discussed what is was like to lose her childhood friend during the Second Intifada who was executed by a gunshot to the back of his neck after tripping and falling to the ground while being chased by Israeli soldiers. She also discussed the time her father was attacked by angry neighbors after he raised the Palestinian flag in solidarity with his fellow Palestinians in the occupied territories during the First Intifada. The freedom to raise one’s flag, a simple act that many people take for granted, has a very different meaning to Palestinians, especially given that it is illegal to do so inside Israel. While forced evictions and home demolitions are commonplace in occupied East Jerusalem and other areas of Palestine today, the expulsion of Palestinians from their lands inside Israel also has a long history. The latest chapter is the so-called Prawer Plan to expel tens of thousands, some estimates suggest up to 70,0000 Bedouin Arabs from their homes and lands in the Naqab (Negev) Desert. Noura has taken part in demonstrations inside Israel against this plan and discussed its history and the implications if it is to be fully carried out. If it goes through, which is a likely possibility with only one more reading to pass through the Knesset, the plan will forcibly displace at least 30,000 Arab Bedouins from upwards of 35 villages and now perhaps as many as 50. These villages are considered ‘unrecognized villages’ by Israel and the state prevents them from accessing water, electricity and other basic necessities. One village, al-‘Araqib, has been demolished more than 50 times in the last two years but has rebuilt itself again each time. 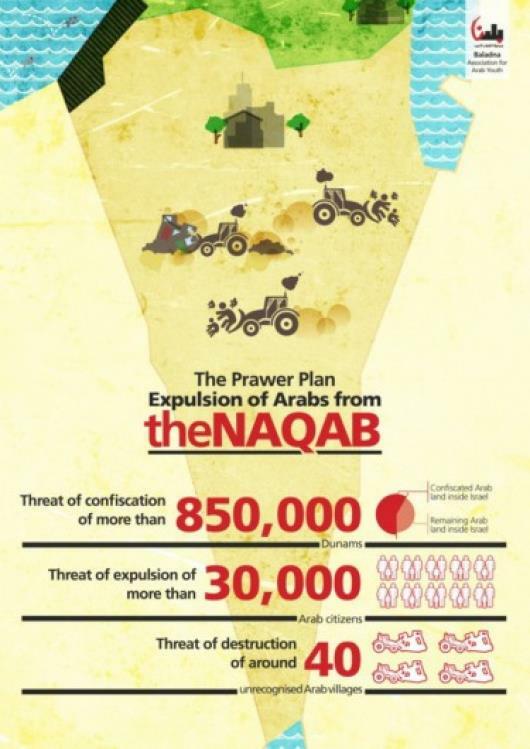 Essentially, the plan would see these communities forcibly resettled in established villages within 1% of the Naqab. It is believed that the emptied land will then be used for Jewish-only settlements and some is already marked out for the development of national parks. 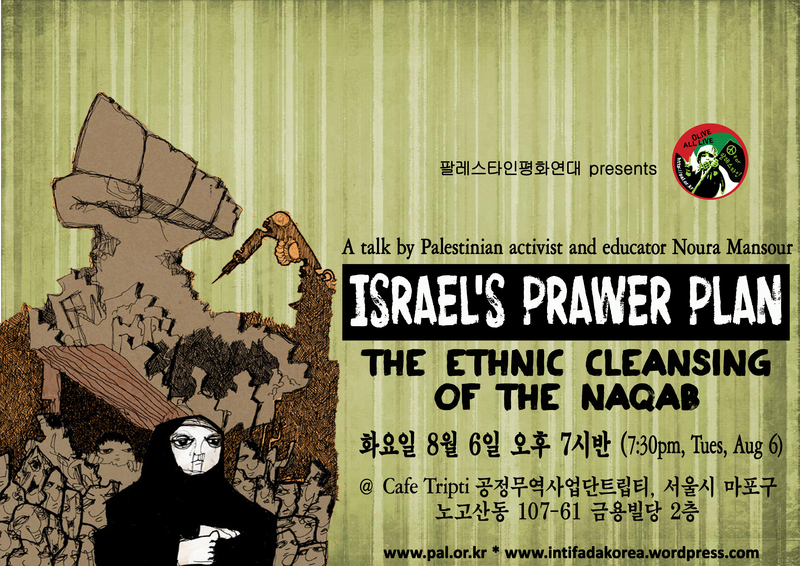 The Prawer Plan, which has been condemned by the UN high commissioner for Human Rights, Navi Pilay, Amnesty International and others, has two main components: ownership claims and compensation and planning arrangements. Ownership can be proven only by the holding of a deed to the land dating back to before 1979 and compensation will be set by law at about 50% of the value of the land and will not be subject to negotiation, meaning there will be no appeal process. There are some other rather strange clauses including a stipulation that in order for compensation to be applicable, the land must not exceed a 13 degree incline and must be productive agricultural land. Noura asked us to consider for a moment the fact that this land is all in the middle of the desert! The second component, planning arrangements, refers to the relocation plan, which would involve all 35 plus villages being resettled in a seven pre-existing villages. Noura finished her talk with a question and answer session and the audience was deeply engaged and clearly moved by her talk. Sadly, she told us at the end that she is unable to get this kind of receptive audience and support back home. Palestine Peace & Solidarity was extremely grateful that she was able to spend the evening with us and share her personal experiences and also bring everyone up to speed on Israel’s plans to ethnically cleanse the Naqab. We hope that many were and will be moved to take action. Click here to take action to demand the Prawer Plan is stopped! Please also help by spreading the word and sharing this post.